Most people in Issaquah, especially history buffs, recognize the name George Washington Tibbetts, but few knew of his brother. Henry Harrison Tibbetts has remained all but invisible. Lavera Mitchell, Henry Harrison Tibbetts granddaughter, generously shared the following family photos and stories with the Issaquah History Museums. Henry Harrison Tibbitts came west from Missouri with his brother, circa 1875. Henry’s wife, Arianna accompanied him along with two of his three eldest children, Georgianna and Frank. Their oldest child, Jenny, had already left the family to join the circus. 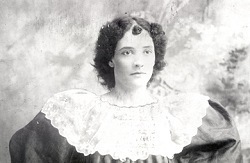 She later became a traveling vaudeville performer, performing in make-up and elaborate costumes. The family first settled in Oregon, where Georgianna married a barber named John Mallies. Another son, Arthur, was born to Arianna. When Arthur was three, the family moved to Squak Valley. Their home was near today’s intersection of 56th Street and E. Lake Sammamish Boulevard. Pearl, their youngest daughter, was born there in 1884. In the 1880s, Tibbetts worked as the first mail carrier in the area. His route took him from Newcastle to North Bend. One winter a fierce storm brought more than four feet of snow. The snow was frozen solid, and Tibbetts had to drive his mail carriage on top of the drifts. Tibbetts was 91 when he passed away in 1926; Arianna had died in 1914 at age 70. All of Henry and Arianna’s children married, some more than once. Arthur Tibbetts married three times. His third wife was 31 years his junior. 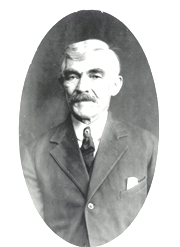 Frank married and had two children, Irving and Georgia. Frank and Irving operated the Issaquah Sand and Gravel Company. 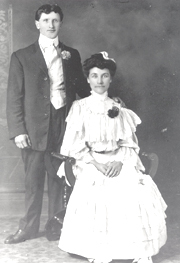 Pearl Tibbetts married Pete McCluskey, the son of Irish immigrants. Their sense of fun is evident in one family photo of the couple wearing each others hats and grinning. They had two children, Marvin and Lavera. Sadly, both Pete and his son Marvin died in 1935. After their deaths, Pearl worked in a WPA sewing room in Renton. Lavera, now the owner of her fathers Model T Ford, left school each day to pick her mother up. She was one of the few girls at school who had her own car, which gave her a respected status among her schoolmates. Lavera McCluskey Mitchell still lives in Issaquah, still in the house in which she was born. This is quite a feat, given that the construction of I-90 and other factors required that the house be moved twice. Information in this article derived from interviews with Lavera McCluskey Mitchell, Issaquah Press obituaries, census information, and the writing of Carmen Ek Olsen. Our thanks to volunteer Monita Horn for her obituary research. If you have information about your, or another, pioneer family in Issaquah that would like to share, please contact the Museum Director at 425/392-3500.